Browse > Home / Gymnastics / Exciting Summer Gymnastics! 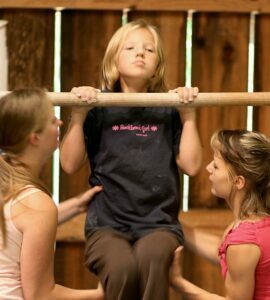 Girls who attend Rockbrook Camp can take a regular gymnastics class. These summer gymnastics camps are just one of the many sports activities available at RBC. Beginning with basic flexibility, balance and strength training, you’ll work on tumbling, rhythmic gymnastics, balance beam, spring board, and parallel bars. Even if gymnastics is not your sport, being in a summer gymnastics class at camp is really fun and exciting because you will certainly learn new skills (tricks! ), get some good exercise, and be with your friends. It’s amazing what, with personal instruction and a little practice, you can accomplish. You’ll be doing a flip in no time! 2 Responses to "Exciting Summer Gymnastics!"